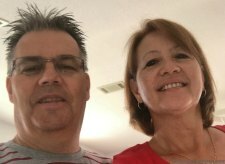 When we made up our budget years ago, (you can read about it here) we made sure we had the funds we needed for everything from high priority expenses like the mortgage and electric bill all the way down to funds for going out occasionally. The amount of money we decided that we needed to buy groceries and pay for gas for our cars (we lump them together into one category) has a history that started when gas prices reached over $4.00 a gallon in 2008. We felt the crunch at that time for sure. We had two boys in college so money was tight as it was. I remember spending $100.00 to fill up the van in Buffalo after visiting our younger son, Mike, when he attended the University at Buffalo. The money we budgeted for groceries and gas was definitely not enough to cover the high cost of gas then. The only choice we had was to take money we had allocated for entertainment and vacations to pay for gas. Soko's raise that year went straight into the grocery/gas budget. After all the tweaking of our budget, we finally had enough in our grocery/gas account to cover the astronomical cost of gas but no money to go to a movie! Well eventually, as we all know, the price of gas finally came down. But we never lowered the amount we set aside for groceries/gas because I was so worried that the price of gas would get ridiculous again one day. So now we are way over budgeted for gas but we are ready for when gas climbs to over $4.00 again! Most months we have a surplus in our grocery/gas account because of the over budgeting. 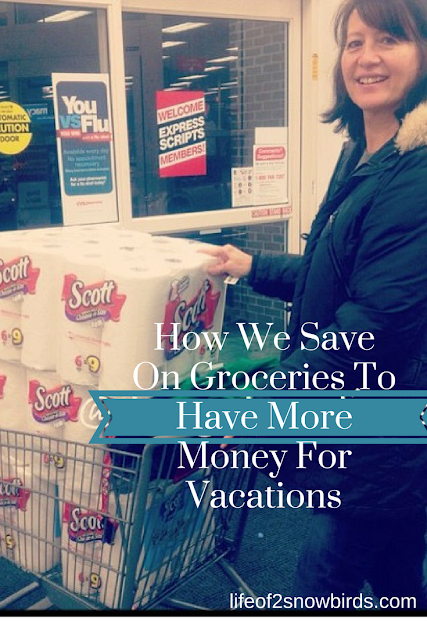 But sometimes we actually use the extra money to buy extra groceries when we have guests staying with us. Or we need the extra to pay for gas when we take a road trip. But what do we do with the surplus when we have it? Put it in our vacation fund! More vacation money equals more vacation! Because I am conscience of the fact that the less we spend on food and gas, the more we can spend on vacation, I try to spend the least on groceries and gas as we possibly can. So what are some of our strategies for spending less on gas. One way we save is to have a mapped out plan of all our stops when we are running errands. We think of the most direct way to get to each stop and go in order of which stop is next on the route without backtracking. If I think of something else I need when I am out and it is way off my route I usually tell myself it can wait so I don't have to waste gas getting there. Another way we save on gas is to find Pilot Flying J gas stations when we are on one of our road trips. You can read why here. The apps that I use to get cash back for the groceries I buy are Ibotta, Checkout 51 and Saving Star. I check these apps to see what items they are giving cash back on before I go shopping. Also, I might have been alerted by Living Rich With Coupons or Drugstore Divas that there is a good cashback deal at one of those sites. Once I have bought the cashback item, I will need to take a photo of the receipt with the item listed then scan the UPC of that item. The cashback money accumulates over time and when I have made at least $20, Ibotta deposits those funds in my PayPal account. Saving Star will deposit to my PayPal account when I request it without a minimum. I need to have made at least $20 to cash in at Checkout 51 and they will send me a check. I get paid to buy groceries and that money goes to my PayPal account and from there into my savings account and right into our vacation fund! What could be sweeter than that! 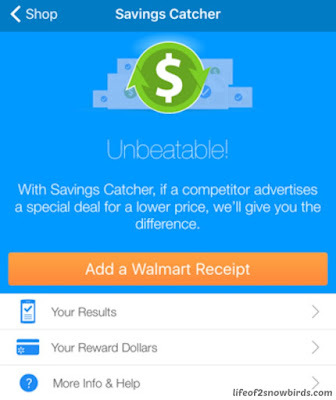 Another great app I use regulary is Walmart's. They have a program called Savings Catcher. 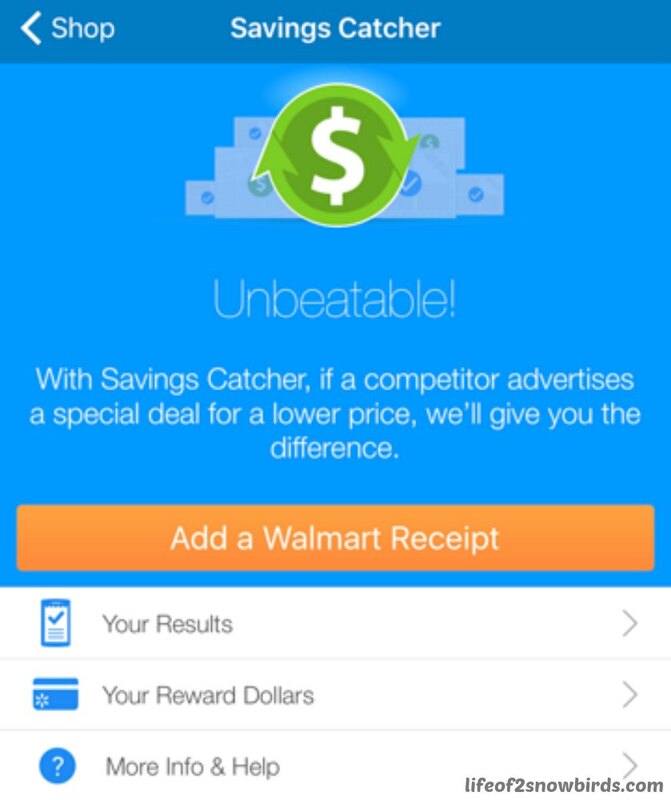 How it works is Walmart will check their competition to see if any of them has a lower price on the items I bought at Walmart. They will refund the difference in price if they find a lower price. The refund gets put into my account. The next time I shop at Walmart, I use Walmart Pay to pay for my groceries and if I have any refund money in my account it gets used first then the credit card I registered gets charged. This is another easy way to get paid for buying groceries and for paying less when I buy groceries. Nothings easier than using a credit card when shopping (as long as you pay off the balance every month). This is where I earn the most money buying the groceries and gas I have to buy anyway. I have to say I love the cash rewards that I get from my bank, Bank of America, for using their credit card. You can get 1% back on anything you buy, but more exciting is that you can earn 2% back at grocery stores and wholesale clubs (that means Costco for us) and 3% at gas stations. But that's not all! Every time you transfer your cash reward into your Bank of America savings or checking account, they will give you 10% more as a bonus. If you are a Preferred Rewards Client you can receive 25 - 75% extra back. So every time you transfer $100 cash rewards money into your savings account you can get up to an extra $75! You probably saw this coming, but guess where my cash rewards go! Do you own a Fitbit? I am registered in Walgreens Healthy Choices Program. I can earn up to 1000 points a month just by walking. Once I earn 5000 points I have $5.00 to spend at Walgreens. That's another $5.00 less grocery money I've spent. I don't buy less groceries to save grocery money I just find ways to spend less on the groceries I do buy. Do you have any money savings strategies when it comes to buying groceries? I would love to hear about them! Thank you so much for sharing all your tips with Celebrate It! I live in NC also, and I am a loyal reader of Drugstore Divas, so I am excited to know that Lisa is your daughter! Thanks again for linking up at Celebrate It! We love living in NC. I told Lisa about your comment and it made her day! You have shared some great tips here! I use a Fitbit and I didn't know about the Walgreens Healthy Choices Program, I will be signing up for that! Thanks so much for sharing at Celebrate Your Story! Thanks for letting me know you learned about Walgreen's program from my post and for hosting such a great party! Up here in Maine, we have Hannaford's and Shaw's as our big grocery stores, Walgreens and Rite Aid are my 2 favorite drugstores for bargains. I don't budget money tightly; I am lucky! But I scrounge! These grocery stores mark down their short dated meat; that's how I plan 80% of my menu. While my boyfriend hits the deli counter for meat and cheese ends (3.99 a pound vs. 4.99 to 8.99; boy do we have interesting sandwiches and omelets! ), I hit the meat counter, then veggies to match. Each meat package is .75 to $3 off. I come home, put stuff away and turn the oven on to bake most of my great finds (even hamburgers go in!). We eat for the week and if I've overbought, I tuck stuff into the freezer in meals-for-2 packets.Supper prep is a lot easier. I always thank the cashiers for doing my menu planning and they grin! That's an easy $6-10 off weekly. I keep an open mind and buy bargains when I find them; I have shelving in the cellar for extras. If $ is tighter, we eat out of the cupboard and freezer! We call our downstairs trips "going to the store." Couponing was easier when the 2 kids were home with a dog and a cat....sugared cereal, pet food, junk food, shampoo, soap, etc.! There should be more coupons for hamburg and chicken! Great bargains get donated to our local food bank. Our church fills backpacks with simple to prepare foods, underwear, socks, pants for those accidents, school supplies, etc. for kids in need (I cornered the market in Good Will this spring when winter hats, gloves, and mittens were 75 and 90% off. We retired now so $ is tighter but I like giving back where/when I can. Spaghettios on sale, I have a c/o--done! With school supplies on sale now, I will check flyers and buy rulers here, pencils there, and glue sticks over there for backpacks, Ladies Aid mission efforts, and Samaritan's purse Christmas Child shoeboxes. Stickers at Dollar Tree for .25--above and 5 grands! It's a game I can always win! Thank you so much for your sharing your great ideas! I wish we had a Hannafords and Shaws in my neighborhood. Sounds like you can find really good buys there. I love your idea of buying all the school supplies. I always wind up paying full price when I donate. Can't believe I never thought to buy lots now when school supplies are dirt cheap!